In honor of Darwin’s upcoming birthday, Feb. 12th,and International Darwin Day we decided to make a special cocktail to celebrate the man and his work. Julia suggested something to do with finches since Darwin wrote his seminal work on them. With that in mind, Shaun wanted to use yellow chartreuse to denote yellow finches, even though most finches in the Galapagos are brown. We thought we’d go with gin for the base spirit. Why gin? Well Darwin was British wasn’t he? Christa wanted to use aquavit for the slight savoriness of the caraway, and she felt it would play well with the gin. We also wanted a drink that would evolve as you drink it. Shaun gave Christa this book for Christmas. ; it gets into the molecular mixology side of things. 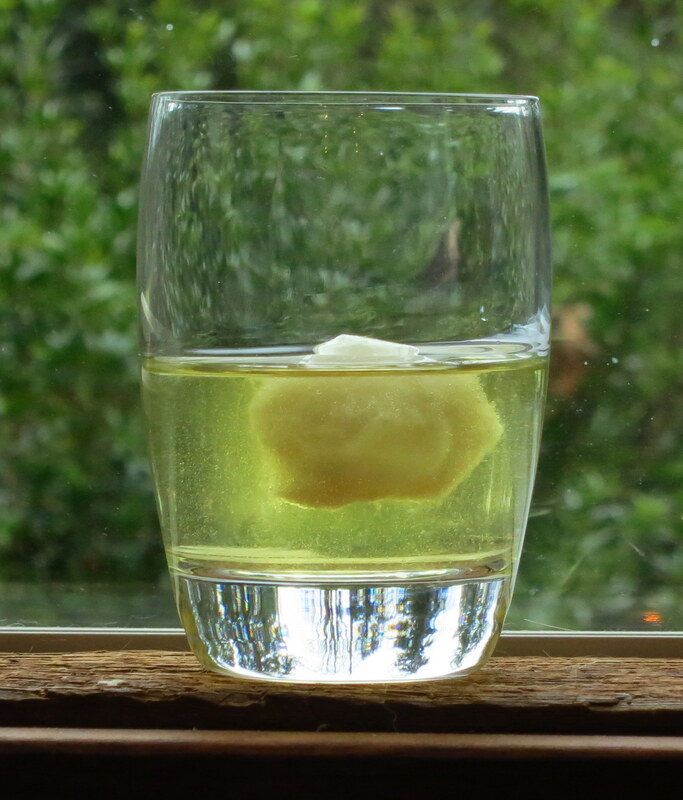 It inspired her to add some lemon sorbet to the drink to convey a nice citrus note, but also to have the drink change over time as the sorbet melted. We also thought the sorbet ball would look like a little bird’s egg, which it does as it melts down. Stir with ice and pour. Garnish with a melon-ball-sized scoop of lemon sorbet (we used the Ciao Bella which is very lemony and not as sweet). The Darwin’s Finch starts as slightly bitter, very herbal, spirit forward drink that evolves (see what we did there :D) into a sweeter, citrus-influenced drink as the sorbet melts. We made two versions to see the differences in how they came out. In both cases, they got more citrus-y as the sorbet melted, damping down the bitter and playing up the herbal notes, especially in the gin. We have 2 aquavits (or akvavit) here at Casa de Nerd (of course we do. 🙂 ). One is the Krogstad from House spirits in Portland. The other is from Sound Spirits here in Seattle. For those of you who aren’t familiar with aquavit, it’s one of the under appreciated spirits, to our minds. It’s a traditional Scandinavian spirit flavored with caraway or dill, so it can add nice savory notes to a drink. Both of our local producers make very different but very interesting versions. The Krogstad has some really nice caraway and star anise notes in the nose and on the palate. The Sound spirits has dill characteristics and sweeter notes on the nose and palate plus a really strong savory note on the intro. The version with Sound Spirits aquavit is a little bit sweeter and spicier. It starts with slight bitter and herbal notes with dill standing out slightly. Then moves into spice, cardamom with a little bit of anise, no caraway. Lemon peel on the finish, probably from the lemon bitters.This version is spicier, a little cleaner and fresher, more lemon. The version with Krogstad has darker flavors, more green herbal and toasted spices like cumin and caraway. Gives it kind of savory underpinnings. Starts with caraway and anise, then the cumin from the Voyager and the herbal notes from the chartreuse come up. Lemon and caraway really pop on the finish. This entry was posted in aquavit, Cocktail, cocktail recipe, gin, Original Cocktail, yellow chartreuse and tagged aquavit cocktail, chartreuse cocktail, darwins finch cocktail recipe, gin cocktail, house spirits krogstad aquavit, lemon sorbet cocktail, sound spirits aquavit. Bookmark the permalink. I see what you did there, and I laughed. Using a flavored dilution agent is an interesting play and one I’ll have to experiment with. Great post! Thanks! We’re very pleased with how it turned out. It’s definitely an interesting idea to have the drink change flavor over time.